Day before the split with the Shiv Sena, the BJP had insisted that it needed 135 seats at the minimum. With the smaller allies in the Mahayuti likely to settle for nothing less than 18, at best 14, the stage was set for the Sena to be restricted to 135 or eventually 139. That would have ensured a level playing field between the Sena and the BJP as well as created an opportunity for the BJP to use its traditionally higher strike rate to take a shot a chief ministership. Since the first assembly election alliance of the Sena and BJP in 1990, BJP has performed better than the former in terms of strike rate. In the 1990 assembly election the BJP’s strike rate was 40% while that of the Sena was a mere 28.64%. The gap was thus 11.36%. In the 2009 election the gap was close to 11.16% after two decades of narrowing down. A logical corollary of this theory would be that the BJP would for sure gain more seats with a better strike or seats closer to the Sena. Moreover simply contesting a larger number of seats would help increase the BJP’s vote share. In addition to this increased vote share if the BJP could leverage the upwardly mobile neo middle class to its advantage then it could exploit the first past the post system and get past the mark in many seats. Votersmood Research carried out a survey of randomly selected respondents following the right hand rule across the city of Mumbai and its satellite areas. A total of 1100 samples were covered in this. Apart from this, a study was also carried out across seats where the BJP had not contested earlier. The results of the study threw up interesting results. These are 56 seats that cover the districts of Mumbai Subuarban, Mumbai City and Thane ( which includes the city of Thane, and Navi Mumbai). There are no losers in the BJP-Sena split. Ironically, both the Sena and the BJP gain. 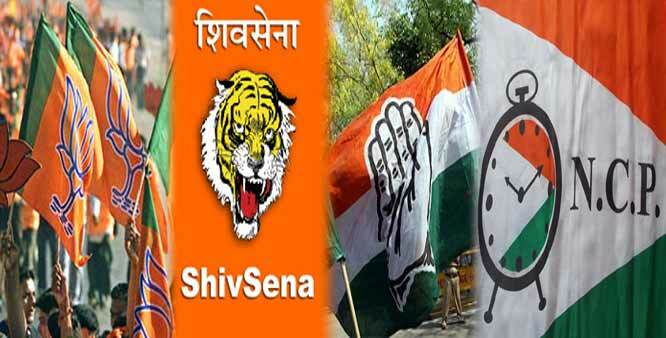 The Sena gains due to a consolidation of its supporters behind it. In the 2009 assembly election, the MNS polled 20% of the votes in this region. The MNS is now down 5% to 15% in this region. 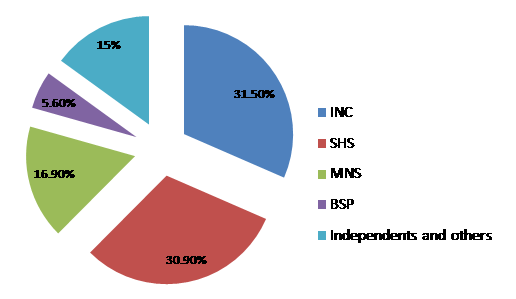 The Sena on the other hand sees a growth in its vote share from 19.75% to 23.75%. A section of the study focussed on seats that the BJP did not contest before. We assessed where the BJP’s vote share had come from in such seats. The BJP sees a huge surge of votes coming equally from the Sena and the Congress. Its vote share in this region rises from a base of 10.5% to 18.5%. This increase comes equally from the Sena and the Congress. There are two explanations to where this new found base of the BJP comes from. The coming of voters from the Congress explains partially the payoff of the BJP’s gamble. Many of these would have been traditional BJP supporters who might not have voted the BJP for so many years because of the Sena alliance and now see an opportunity to support the BJP again. The other reason could be the BJP emerging as the first port of calling for anti-incumbent voters who have left the Congress and want to go elsewhere. In the larger picture the Sena, while losing 11% of its voters to the BJP, gains from other parties like the MNS and the Congress and registers an overall gain of 4% in its vote share. The split therefore leaves the Congress then as the biggest loser as it loses anti incumbent votes to the BJP, Sena while also losing voters to BJP in the seats where the BJP earlier did not have candidates, and many of the traditional supporters of the BJP ended up voting for the Congress. The Congress could thus see a huge swing of 7 % away from itself, reducing it to a bare minimal 14% in this region. Does that mean that the Congress may not win any seats. Quite to the contrary, the five way fight in many seats will leave winners with vote shares often in their early twenties. Moreover this vote share is likely to be highly skewed in its distribution across seats. This election will see Mumbai being transformed into some sort of Jharkhand where winners are often close to forfeiting their deposits.